The Grand Journey is one of the most exciting mobile slots games because it offers you the chance to explore deep into the prehistoric Amazon jungle. On this exciting quest, you will run into now extinct creatures, erupting volcanoes, intimidating stone idols and perhaps an exotic female or two. This 5-reel, 30-payline game allows you to wager as little as $0.30 to as much as $12.00, making this a great gaming option for penny slot lovers and maximum betters alike. You can win as much as 12,000 coins in the base game and up to 120,000 in your Free Spins rounds. The Grand Journey game symbols include the Jungle Explorer, his exploration gear, a beautiful Amazon lady, scary Dinosaurs, ferocious Saber-Toothed Tigers and colorful jungle Mushrooms. The Grand Journey Logo is the game's Wild symbol. It can show up anywhere on the 5 reels, substituting itself for other symbols to give you even more winning paylines. The Grand Journey Logo also doubles your payouts on any payline it completes. The Grand Journey slots game also gives you an Expanding Wild symbol in the form of the Drill, but this symbol only pops up on reel 3. This Expanding Wild helps create numerous winning payouts with just one lucky spin. The Globe is this game's Scatter symbol, guaranteeing you a payout if you get two or more symbols anywhere on the reels. Spinning three or more Scatter symbols nabs you 15 free spins with a Multiplier Trail. The Multiplier Trail adds a number to the multiplier value each time you use a non-winning Free Spin. You can reach a maximum multiplier of 10x the original amount. 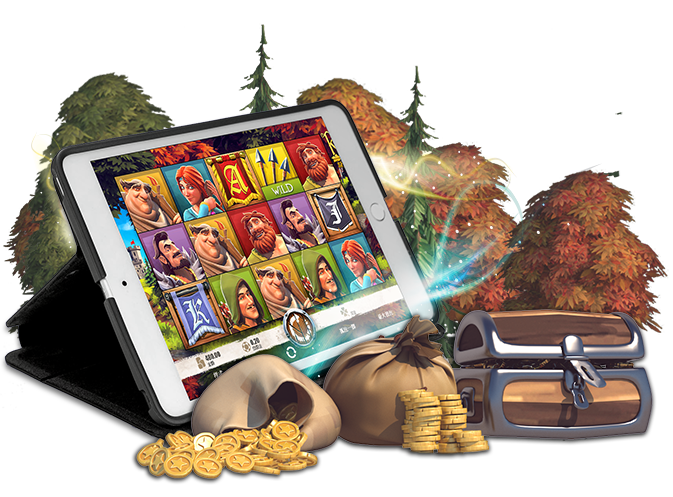 This is certainly one of the most appealing elements of The Grand Journey mobile slots game. The great sound effects and impressive graphics combine to make The Grand Journey one wildly entertaining game. This slots game provides gamers with enough winning opportunities to make it a worthwhile addition to your mobile slots games lineup. Ready to play but not ready to bet? No problem! You can play free mobile slots games. This will allow you time to get familiar plus you will still be thrilled and entertained.